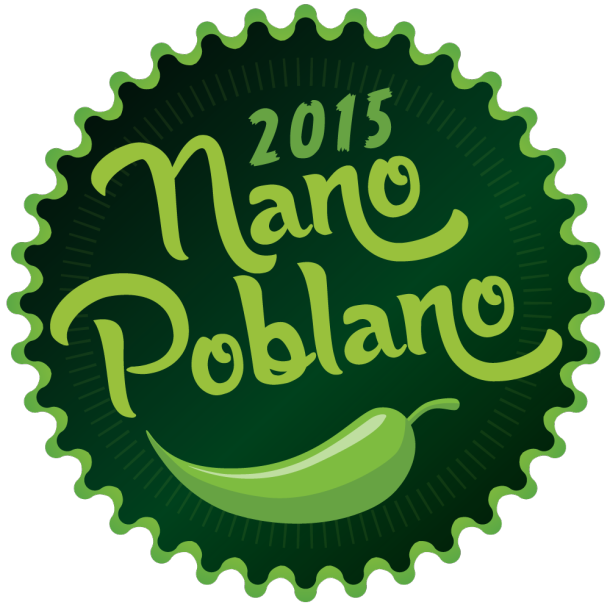 My participation in Nano Poblano (it’s like NaBloPoMo) is my second. And it’s weird. Not in a ‘can I lick your elbows?’ way, but in a ‘wow, this is a really comfortable couch, do you mind if I take off my shoes and put my feet up?’ Which isn’t weird except it’s like having that thought at work instead of at home. Nano Poblano hasn’t stressed me this year. I’m not panicking. I’m not feeling guilty. I’m doing what I can, when I can. And I’m still writing, I’m still thinking of things I might write about and I have eleven posts pending. Like with anything second time around, there’s a familiarity that gives you a little more confidence. Interestingly, I’ll probably fail this time because of it. Last Thursday I got up at 6:20am and got home at 10:00pm and felt exhausted. Last year I would have propped my eyelids open with match sticks and posted something, but instead I pardoned myself. I might not catch up. The good news is, I’ve already proven I can DO THIS and it is still a great motivator. Or National Blog Posting Month. Or, if you follow Rarasaur, it’s Nanopoblano which is the same thing, but more awesome. And while I’m potentially still jet-lagged, I have just travelled for 6 weeks and I hopefully have a fair bit of blog-fodder to work with. I’m giving this a go. I’m blogging every day for the month of November. Let’s get back on the horse. Pinch and a punch for the first day of the month. Or is that an Australianism? Visit the other Tiny Peppers here! Or as we Tiny Peppers like to call it, Nano Poblano. Or, as I’ve been calling it lately (today), NaNo Problemo. So, Day 30. Here I am, I took you on. I won. The only day-fail coming off the back of an ice skating accident and taking my friend to Emergency. Friday the 13th and all. But I caught you up. IN YOUR FACE, November. IN. YOUR. FACE. So, where am I at? What will this mean? Has it changed my life? Time will tell. Today, I feel I will blog more often, which honestly, is a stupid thing to say because blogging more often than I did before NoBloPoMo won’t exactly be a stretch. But, irrespective of whether I do or don’t – I know I can. I’ve blogged every day for a month. WOOT! Two years ago I didn’t think I’d ever do that, the very thought would have made me vomit. I’ve been forced to rein in my self editor (who’s normally brutal). And I’ve been posting with mistakes. I been posting without twenty-million re-reads. Without relying on my husband’s proof-reading. Congratulations to those who took on NaBloPoMo and/or Nano Poblano and won. And congratulation to those who gave NaBloPoMo and/or Nano Poblano a go. There are no losers. You’re all amazing. And I wish to thank you. All those people who’ve found me here during my thirty day blogging frenzy with special thanks to those who’ve taken the time to leave a comment. I have found new friends here. And thank you, Ra. You have no idea how much awesome you make. A list-post. One of my own invention. It’s not that I intend to collect things, but sometimes I find myself gravitating towards similar objects. They’re accidental collections. They are things I have many of and it’s, shall we say, unusual. We’re not talking dinner sets here. Or napkins. Or chairs. Or bowls. Or cushions. Or socks. We are talking normal things at crazy, random levels. A bowl of billiard balls. Several sets of them, all together. I do not own a billiard table. I lost count at 50+ dog ornaments. Keeping in mind, some of these are in miniature. I also have similar levels of cat ornaments (some of these in miniature). Ornaments (often animals, sometimes figures, sometimes vases). Things in miniature (often animals, sometimes figures). Pictures. My walls are covered in pictures. And I have places where many lean against walls where they hope to be placed. I am hopeful of this myself. I also have a staggering number of frames I intend to restore, an equal number that require pictures and some that need glass. String lights. I have four sets now. I seem to buy a set a year from a market as people clear their Christmas clutter and I make it. Candle holders, like those you may associate with ol’ nimble Jack. I find their form aesthetic and who knows why. I don’t use them, but if there’s a blackout, I’m sorted. 4 Bibles, 4 prayer books, 2 hymn books, 2 sets of rosary beads. It’s not that I’m especially religious, but I love objects with meaning. Those that are touched and loved and used. Book ends. I love books, so perhaps this isn’t that strange. Doll’s heads. I’ve never been into dolls, but seem to want to ‘help’ those missing pieces of themselves. Salt and pepper shakers. Often kitsch in style. My aunt helped me to appreciate these quirky objects. Things that are green. Seriously. My liking of objects can be entirely dependent upon this. I often have a conversation with my mum that goes along the lines of ‘Oooh, I like that.” and Mum’s all unsurprised, ‘Well, it’s green, isn’t it’. I hoard sewing stuff and stationary and fabric. Because you just never know when it will come in handy. Some of it may be useful when I’m aged 93. Better stop. I keep thinking of things to add. I’ll probably think of another five more as I drop to sleep tonight. Anything you have in crazy quantities? Day 29 of Nano Poblano!